Paper wasps serve an important ecological purpose as predators of other insects. They feed caterpillars, beetle larvae, and other insects to their young. 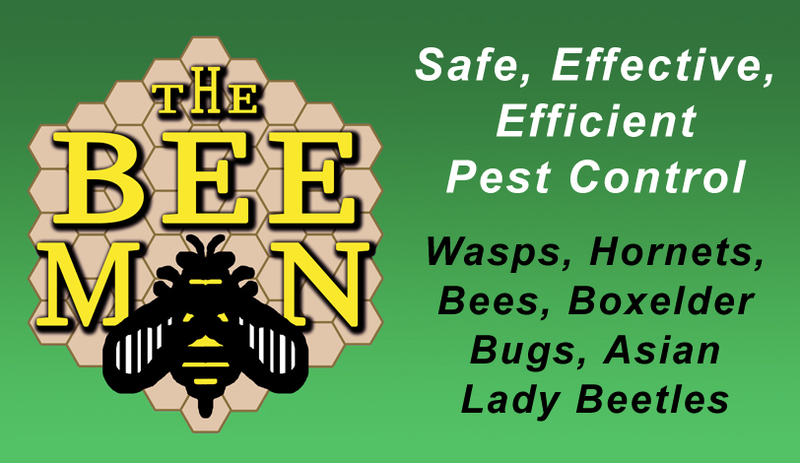 Paper wasps are 3/4″ to 1″ in length. With their familiar, slender, yellow- and black-striped body, they are very similar to other types of wasps. They can, however, be distinguished from other wasps in two ways: nest and flight pattern. Paper wasps construct paper nests, often seen in eaves or suspended from porch ceilings or in hidden areas like wall voids and gutters. The nest can be distinguished by its open-celled, upside-down, umbrella look. Paper wasps can also be distinguished from other wasps by their flight pattern. When they fly, look for the distinctive dangle of their back legs. Bees and other wasps tuck their legs up close to their bodies when flying. Every spring, the queen builds a new nest, which she does by combining wood fibers and saliva into a pliable pulp. By summer, the paper wasp nest can be quite large, reaching a width of 6-8 inches. In fall, the newly hatched queens abandon the nest and will seek shelter in a new location to hibernate for the winter. 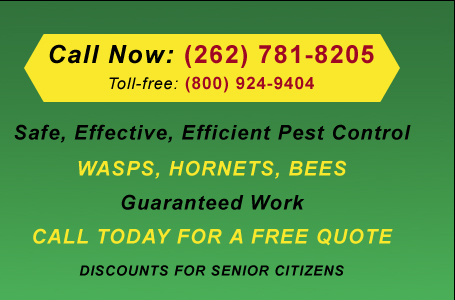 Paper wasps can and will sting in defense of their nest, or when threatened. Unlike honey bees, which have barbed stingers and can only sting once, paper wasps can sting multiple times. 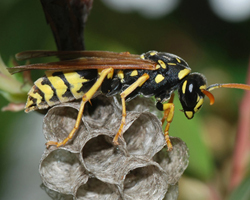 A paper wasp can call other colony members using alarm pheromones, chemical messages that tell other wasps to help defend the nest from a threat. Try to stay calm and avoid swatting at paper wasps. Though paper wasps are beneficial insects, they tend to nest in close proximity to people, putting us at risk for stings. For that reason, it is sometimes best to eradicate them from the area. Knocking down a nest may be an effective solution for a short time, but any wasps that survived your attack, will simply rebuild the nest when they return to find their house destroyed. Please call our office for more information.